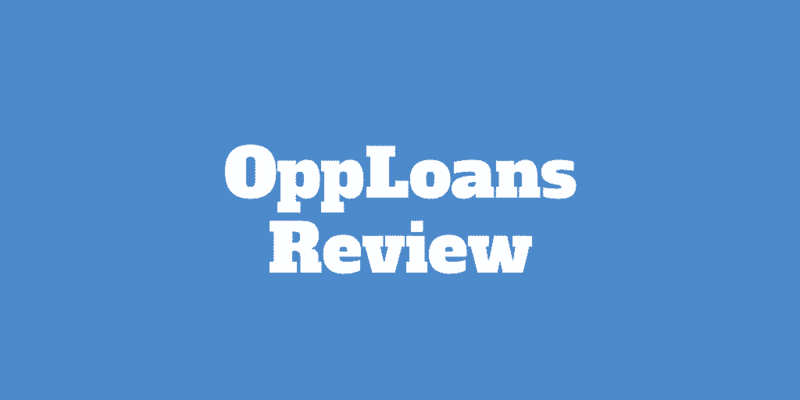 OppLoans Review: If your credit score is average or below average and you are struggling to find an online personal loan provider who won’t sting you with the high rates typical of payday lenders, OppLoans is well worth checking out. Unlike many predatory lenders who take advantage of people in need, OppLoans is highly customer-focused and has earned an A+ rating from the Better Business Bureau. And considering it has served over 100,000 customers, Opploans reviews are astonishingly good overall. Not only is it due to the company’s personal touch, but its rates tend to be more reasonable than payday lenders and processing times are fast. But before getting started with OppLoans, what else do you need to know? Why Choose OppLoans Personal Loans? Is OppLoans Right For You? OppLoans Review: How Does It Compare? It can be difficult to get approved for a personal loan from a bank or credit union in a hurry. Yet when your car suffers from a fender bender, bills pile up, rent payments are due, medical bills arrive, or you simply need a better rate to pay off debt, fast access to capital is a must. It is at these times or simply when you are looking to make a big purchase when OppLoans personal loans could be the financial crutch you need to get fast access to cash. The rates at OppLoans are not cheap but they are much more competitive than many alternative lenders. Compared to title loans, payday loans, and bank overdraft charges, OppLoans is a more affordable alternative. Unlike payday loans which are almost by design constructed to keep you in debt, OppLoans provides clear terms so that you can pay off your debt and move on. For example, you won’t be hit with prepayment penalty fees or hidden fees that are often lurking under the surface with payday loans. And instead of the typical 2-week terms to get rid of your payday loan, OppLoans provides terms as long as 3 years. Not only that but you can build your credit with OppLoans, a benefit usually not afforded to you when choosing a payday lender. The icing on the cake at OppLoans is the rates can be half what payday lenders charge, or even lower in some cases. Plus, you don’t have to worry about deceptive billing practices because transparency is a key feature. Employment: To be eligible for a personal loan from OppLoans, you will need to be employed part-time or full-time, or be self-employed or retired. Age: You must be at least 18 years of age and earn a minimum of $18,000 per year. Military: Both veterans and non-military civilians are welcome to apply but in either case, you must be a permanent resident or U.S. citizen and have a bank account. Credit Score: If you credit score lies between 350 → 600 then you are a candidate for an OppLoans personal loan. Tax Forms: Before you apply, make sure that you have proof of income via pay stubs and can provide the necessary tax forms, such as your W-2. When you apply for an OppLoans personal loan, it will not affect your FICO credit score because a soft credit check, as opposed to a hard credit check, is conducted. You will need proof of income and recent pay stubs but once you’ve jumped through the paperwork hoops, the timeline to funding can be as fast as 24 hours. At that time, an origination fee of up to 3% may be charged. It is deducted from your loan amount before your money is deposited. If you need $3,000 yet discover that a 3% origination fee will be applied to your borrowings, make sure to ask your customer representative for a slightly higher amount so you get the cash you need into your hand net of the fee. Although no prepayment or penalty fees are applied, you will be hit with late fees of up to $10 when you don’t pay your bills on time. It is very much in your interests however to make timely payments because they will be reported to the major credit bureaus: Equifax, Experian, and Transunion. By paying off your debt regularly and on-time, you get a chance to build up your credit score, so down the line you may be eligible for lower interest rates. OppLoans personal loans won’t penalize you with prepayment penalty fees or hidden fees but you may be charged an origination fee up to 3% of the loan amount and late fees of up to $10. Compared to other personal loan providers who also serve borrowers in need of fast cash, OppLoans ranks among the best. For example, Mobiloans is an alternative for borrowers who are confident they can pay back loans in a hurry. But failure to pay money back triggers expensive penalty fees. Plus, billing cycles are twice monthly. On the other end of the spectrum is SoFi, which lends to super prime borrowers with excellent credit scores. SoFi personal loans usually have lower interest rates but you must typically be a high income-earner to qualify. If you have time on your hands, a bank or credit union may offer you more favorable rates than OppLoans. ✅ Competitive Rates: Among lenders who serve borrowers with average credit, poor credit, or bad credit, OppLoans charges competitive rates. ❌ No Cosigner Support: Individuals must apply directly and no cosigner support is permitted. ✅ Excellent Customer Service: OppLoans is renowned for its top quality customer support and has earned an A+ rating from the Better Business Bureau. ❌ Origination Fees: Up to 3% of your loan amount may be deducted in origination fees. ✅ Fast Application Process: The funding timeline can be as soon as 24 hours. ✅ Personal Loan Amount Range: You can borrow from $1,000 to $4,000. ✅ Generous Term Lengths: Unlike the 2-week billing cycles that are typical with payday lenders, OppLoans term durations can be as long as 36 months. ✅ No Prepayment Penalty Fees: No hidden fees, deceptive billing practices, or prepayment penalty fees apply. ✅ OppLoans Reviews: Reviews of OppLoans by borrowers are, on average, stellar, which is a testament to how well the company has served over 100,000 customers. OppLoans serves borrowers with credit scores of 600 and under who are employed and earn at least $18,000 per year. Loans of up to $4,000 are issued in as fast as 24 hours. If you are struggling to pay for a car repair, medical bills, rent payments, or simply need to consolidate debt to a lower rate, OppLoans is a compelling alternative to a payday lender. The interest rates charged tend to be less than half of what payday lenders charge and the repayment term lengths are much more generous, as long as 36 months. Keep in mind when you apply that an origination fee of up to 3% may be deducted before you get your money, so factor it into the amount when applying. The bottom line is if your credit score is less than perfect and you need access to cash fast, OppLoans has earned a reputation as a trusted and transparent lender with top notch customer support. ‹ Want To Make Money Ripple Mining?